Every strike of the hammer moves the hot metal closer to its ﬁnal shape. Like words on a page, each percussion should be decisive, clear, and move the story along to a conclusion. The plot is simple: take this piece of metal and coax it into something beautiful and functional via forge and aesthetics. The author of this story is blacksmith Garry Kalajian, who simply says, “I aspire to make things that look nice and work well.” For 25 years, Garry has forged metal into art at his shop, Ararat Forge, in Bradford and, for the past few years, shared his craft with students at Sanborn Mills Farm in Loudon. Blacksmithing full time was a later-in-life decision for Garry. First, there was a degree in music as a voice major and choral director. Then there was a master’s degree in environmental education followed by work for a nonproﬁt youth program that brought him to New Hampshire. Throughout his somewhat meandering journey, there were thoughts of hammers and an-vils and the transformative effect of heat on metal. “It was just a fond dream,” he remembers. But there was a seed to that dream. His introduction to black-smithing came when he was an assistant teacher in Northwest New Jersey in the 1980s. It was an alternative school meant to offer students a wider breadth of curriculum, and basic black-smithing was one of the offerings. Intrigued, Garry joined in and learned to turn out simple hooks with his students. At that time, a career as a blacksmith seemed impossible, but the clang of the hammer against ﬁre-softened metal sparked a nascent desire within him. And there it rested, almost hiding, as Garry pursued the life he had trained for at college. Ten years later, Garry was living in New Hampshire direct-ing a nonproﬁt, but not happy. He loved New Hampshire (of course), but his work, while important and valuable, wasn’t ful-ﬁlling. He started thinking about blacksmithing, which led him to read up on the subject and then buy some tools—the smithy slippery slope—and dabble a bit. An artist was born, and the thought of making a career of a craft that had its heyday at the beginning of the last century started to appeal to him. In 1993, Garry left the security of his nonproﬁt job to become a craftsman of metal arts. You could call it a jump from one kind of nonproﬁt to another. The metaphor and potential for humor could take several interesting directions, but sufﬁce to say, being a blacksmith isn’t exactly winning a golden ticket. It’s a calling. Garry set up a shop in a shed behind his home in Weare. He found a mentor, David Court, who helped him learn the trade. He joined the New England Blacksmiths, which is the local chapter of the Artist Blacksmiths Association of North America. Though he underestimated how long it would take to become established, he stuck with it. “It’s like playing a musical instrument,” says Garry. “If you want to play the piano or anything else, you just have to spend the time sitting at the keyboard, learning from your mistakes.” And that’s how he became a blacksmith. His keyboard was an anvil. His music became the rhythm of hammer strikes on hot metal. Not quite choral music, but then, it may just depend what kind of vocalists you are working with. 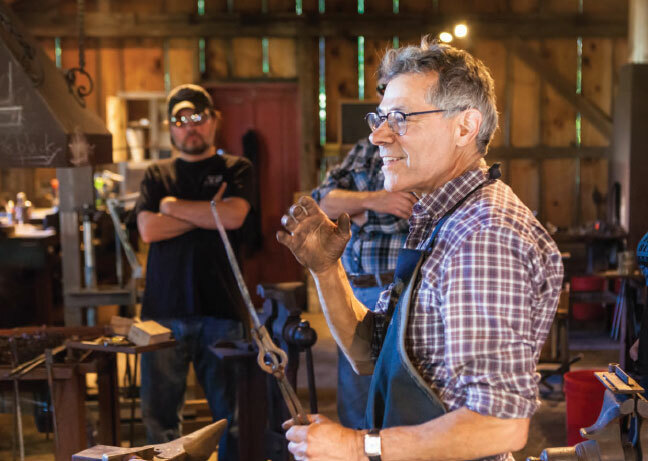 To the casual observer of a blacksmithing demonstration at an old home days celebration or the annual Craftsmen’s Fair at Mount Sunapee Resort (which, by the way, Garry often does), the process seems simple. You heat up a piece of metal, then hit it on an anvil with a hammer, cool it off in some water, and there you have it. Like all creative disciplines, it is that simple, but . . .
Iron was the original metal that blacksmiths used, and there was a reason. Iron has a wide transition from solid to liquid. In the blacksmith business, this is known as the forging range—the temperature at which a piece of metal is malleable. That range for iron is between 1,000 and 2,300 degrees. The wider the range, the longer it takes to cool. This lengthens the time a blacksmith has to work on a piece before it goes cold. The metal’s color tells the blacksmith where it is within its forging range. Steel is more common today, but color is still the key tempera-ture measure. Bellows—electric fans, mostly—pump air across the coals to create intense heat in the forge. Garry explains, “As the bar becomes hotter, it changes color from a dull red to brighter red to orange, and then yellow. When it starts to turn white, you shut down the air and take it out.” The metal is then ready for Garry to shape it. From the forge, the heated bar goes to the anvil where “the primary work, at least in the initial roughing-it-out stages of the bar, is done directly by hammer blows on the anvil.” The black-smith has as much time to work on the bar as it stays hot. But of course, as soon as the metal is removed from the heat, it starts cooling. The window to work could be 30, maybe 40 seconds depending on the thickness of the metal. Once it cools down to dark red, it must go back into the ﬁre. The process is repeated again and again until the blacksmith hammers the metal into its desired shape. Garry notes, “You don’t have the luxury of thinking or analyzing.” Instinct is the force of creativity. With each hit of the hammer you just have to know, and feel, and take a calculated risk every once in a while. If you stop and think, the bar cools and no longer accepts the intention of your blows. “I think the essence of creativity involves using one’s intuitive sense to bring about what one wants to do with a piece of art,” Garry explains. And yet, Garry sees himself as more contemplative than impulsive. Part of his skill must derive from ﬁnding the balance between these two forces: contemplation without thought, intuition without impulsivity. Garry’s repertoire is wide—candle holders, door latches, hinges, candelabras, ﬁreplace accessories, towel racks, napkin rings, even cooking utensils, and the list goes on. If you don’t see what you want, he will take commission work. His biggest piece so far is a gate for a wine cellar. You might say Garry’s life is coming full circle. He started out as a teacher, and teaching introduced him to blacksmithing. Now, having mastered the craft, he has returned to teaching to share the secrets of a blacksmith. It means less time in his shop, but he ﬁnds teaching is easier on his body. So, he tolerates the tradeoff by recognizing he is getting older and that each swing of the hammer takes just a bit more. As with his work in his shop, Garry is serious about teaching his students the basics and then mastery of the craft. His classes run from April until November at Sanborn Mills Farm in Loudon. And they ﬁll up fast. Perhaps Garry is the wellspring of a blacksmithing renaissance. With robots set to take over an ever-larger number of jobs and functions and people addicted to the amorphous world of cell phones and online experiences, something visceral of heat and steel is a human calling that we cannot ignore.